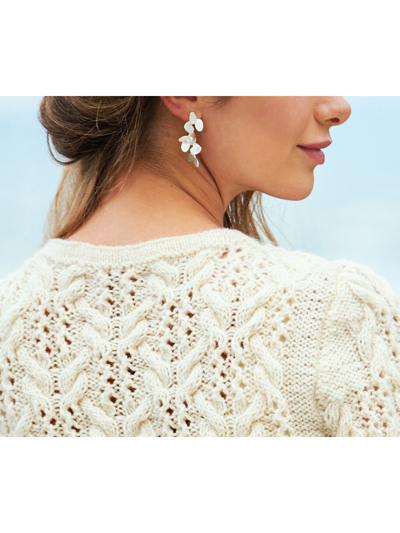 Cablewings surrounded by lace gives this sweater a flowery expression. The A-line shape with lace along each side, paired with the double round neckband, is flattering on many bodies. Knit with 1,378 (1,607, 1,837, 2,067, 2,296) yds worsted-weight yarn using U.S. size 6/4mm and 3/3.25mm needles. Design by Linda Marveng. Bust: 35 1/2 (37 3/4, 43 1/4, 45 1/2, 48)"
Length: 28 1/4 (28 1/4, 29 1/2, 30 1/4, 30 1/4)"